Find the best Sock Monkey Websites! The Red Heel Message Board is the original place for Internet Monkeys to hang out. With a liberal drinking age and live entertainment...it is the place to be. This Sock Monkey Blog reports on Monkey interests around the World. Often times, reporting on the scene! Sock Monkey Fun as a great Gallery of over a hundred custom made Sock Monkeys. 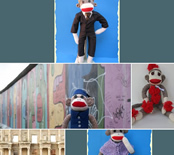 Patterns, kits and bios on Sock Monkeys. We here are SockMonkey.net have seen a few countries (44and counting) but Itsy and Kirby are setting the world on fire! Do yourself a favor and visit this blog! What is a Sock Monkey? Wikipedia has all the information you could want. 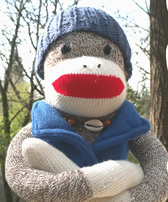 Become a Sock Monkey Expert! I am Missus Mel'nee's first-born sock monkey girl! I live on the Sunnyflower Farm with my familee! From timing to timing we have big adventures, and I would like to share those storees with you! :: Do you have a Sock Monkey Website you want added here? Contact Ceru to get your Website added here.